The commonest cause of bilateral vocal cord fixation is prolonged endotracheal intubation, such as in gravely ill or injured persons, who may spend weeks in an intensive care unit and on a ventilator. Vocal cord fixation can rarely be caused by rheumatoid arthritis. It is also seen infrequently as a progressive, late complication of radiation therapy for larynx cancer. After bilateral posterior cordotomies, “keyhole” shaped glottis. Size of opening at posterior commissure is exaggerated by the wide-angle lens of the distal-chip video-endoscope. 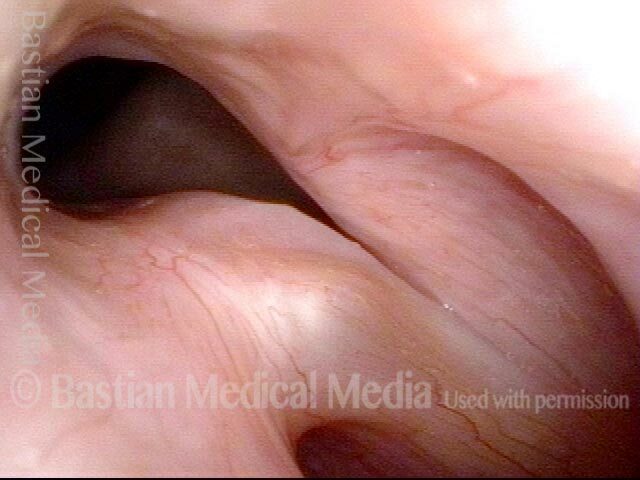 Persistent posterior opening, but musculomembranous cords come into good contact and have not been damaged by either the original endotracheal tube or the posterior cordotomies, and voice is very serviceable.